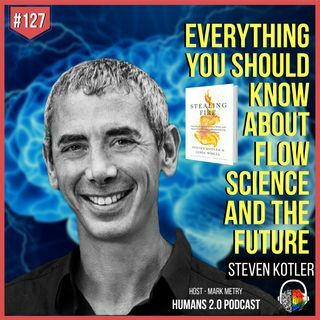 Steven Kotler is a New York Times bestselling author, an award-winning journalist and the co-founder and director of research of the Flow Genome Project. He is one of the world’s leading experts on high performance. His most recent work, Stealing Fire, was a national bestseller and nominated for a Pulitzer Prize. It documents an underground revolution in peak performance that is rapidly going mainstream, fueling a trillion dollar economy and forcing us to rethink how we lead more satisfying, ... Más informaciones productive and meaningful lives. his work was preceded by two books about the technology, Tomorrowland, which is about those maverick innovators who transformed science-fiction ideas into science fact technology, and, Bold, which was called a “visionary roadmap for change,” by president Bill Clinton and spent many months atop both the New York Times and Wall Street Journal bestseller lists. His previous book, The Rise of Superman, was one of the most talked about books in 2013 and the first book in history to land on the New York Times bestseller lists in the sports, science, psychology, and business categories simultaneously. In Rise, Steven decodes the science of flow, an optimal state of consciousness where we feel our best and perform our best. Just as Rise explores the upper limits of individual possibility, his book, Abundance, explores the upper limits of societal possibility, breaking down four emerging forces that give humanity the potential to significantly raise global standards of living over the next 20 to 30 years. Abundance spent 10 weeks atop the New York Times bestseller list and appeared on four prestigious “Best Book of the Year” lists. A Small, Furry Prayer—Steven’s book about the relationship between humans and animals—was a national bestseller and nominated for a Pulitzer Prize; West of Jesus, which examines the neurobiology of spiritual experience, was a Pen/West finalist; and his bestselling novel, The Angle Quickest For Flight, won the William L. Crawford IAFA Fantasy Award. Steven’s work have been translated into over 40 languages and appeared in over 100 publications, including The New York Times, Atlantic Monthly, Wall Street Journal, Forbes, Wired and TIME. He also appears frequently on television and radio, and lectures widely on human performance, disruptive technology and radical innovation. Steven is also the cofounder of Creating Equilibrium, a conference/concert/innovation accelerator focused on solving critical environmental challenges, and, alongside his wife, author Joy Nicholson, Steven is the cofounder of Rancho de Chihuahua, a hospice care/special needs care dog sanctuary in the mountains of Northern New Mexico. He has a BA from the University of Wisconsin, Madison, and an MA from Johns Hopkins University and, whenever possible, can be found hurling himself down mountains at high speeds.